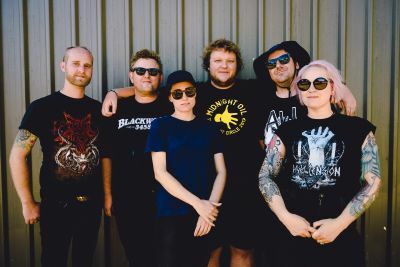 Melbourne folk-punk outfit The Smith Street Band are heading off around the country on their first headline tour in nearly a year, and they’ll be dropping in on Darwin this April for some sweaty pub-rock good times. Frontman Wil Wagner chatted to Off The Leash. You’re about to head off on a massive headline tour around Australia. Apart from playing in Darwin, what are you looking for- ward to about hitting the road? We haven’t toured Australia for nearly a year, which feels crazy because it’s been so long between drinks! We’re getting to play a lot of places we haven’t played before on this run, which is always fun. But we love Darwin, it’s such a weird and wonderful city and we take a day or two off up there every time to explore and hang out. You’re bringing Bec Sandridge and Press Club with you on this tour – tell us about these guys. Why were they your pick for the tour? They’re both super talented and friendly! That’s kinda all we care about with supports, we want bands we wanna watch and people we wanna hang out with. I also think both bands are very underrated and we always try and help out people who we think more people should know. You seem to be endlessly on the road, and you recently support- ed Midnight Oil on their massive world tour. How did that come about? Yeah, just got back from Europe and then straight into preparing for this Australian tour. Was crazy to go from minus six and snowing in London to an Australian summer. They asked us to play with them in LA – kind of out of the blue I think. Maybe a band member or someone in their management team had heard of us, or something like that, but we were all pretty blown away to be asked to play with them. And then to get to play with them again in our hometown of Melbourne was one of the most incredible experiences of my entire life. They were all really sweet to us and made us all feel welcome and it was something I’ll always remember. Speaking of legendary Australian acts, you paid tribute to AC/DC in your clip for ‘Shine’ last year. Tell us about this film clip – was it a lot of fun? Oh so much fun! We wanted to recreate the famous AC/DC film clip for ‘It’s a Long Way to the Top’ except going through the streets of our home suburb of Footscray. We even got the same guy who directed the original clip to direct ours, Paul Drane! It took a few takes but it’s my favourite video of ours, it’s very silly and sweet and a good showcase of beautiful Footscray.